Does the Ami parlor guitar have an unusually narrow neck? It had always seemed as if my Arts & Lutherie Ami guitar had a narrower neck than the other guitars I was used to playing. I was going to include this observation in the post Vacation Guitars but decided I should see if that was really true. The Ami neck width is not significantly different than my Fender Stratocaster or my Epiphone Casino. It is narrower than my primary acoustic guitar, the Martin OM28. 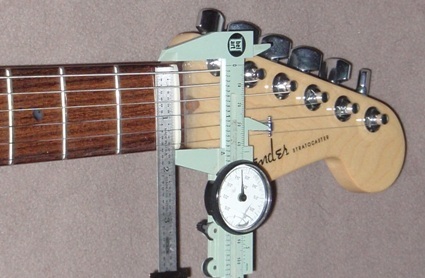 FB @ 12: Fingerboard width at 12th fret. Str @ nut, 12 or saddle: distance between outside edges of 1st & 6th strings at nut, 12th fret or saddle. Measurements made with dial calipers calibrated in 0.1 mm and 0.001 inch and steel rule with 32nd and 64th inch markings . Measurements converted and rounded to nearest mm.